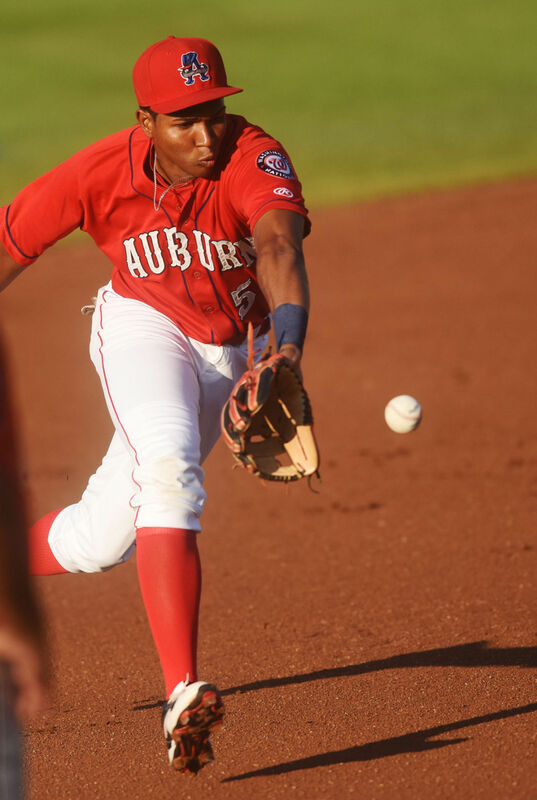 BA's 2016 Prospect Handbook: "Sleeper: Signed as a shortstop out of the Dominican Republic, he has outgrown the position but has developed as a hitter." I like Gutierrez’s actions at the plate and at third base, but he really has to improve his swing plane to tap into his raw power. If he hits the same way he does now, he could challenge for the league lead in ground-ball percentage. I think physical development will help his batting average, but it won’t do much for his power unless he creates more lift with his swing. Regardless, I like his chances of being at least a platoon/fringe starting option at third, with upside as a regular if he makes even slight adjustments. Very solid numbers, to me, while playing at/under league average in age. No power yet, but with that frame, you'd expect him to fill out more and develop some power. If anyone gets to Hagerstown this season, I'd love to hear back with a write-up! Still raking. Hit his first dinger on Sat., too! If he develops game power as his frame suggests, he could be a guy. Still waiting for someone to send back some thoughts on his defense at 3B too! Named to MiLB.com's "prospect team of the week"
.303/.342/.419 for the season. BB:K is still way too high (17:42). 14 errors on the season too (still looking for a report!). Wow. Add in the fact that he's hitting the ball well, and this guy should be a riser next year. He was promoted to high-A Potomac the other day. Assigned to Potomac. Decent start to the year - 148 ABs, .297 / .358 /.432, 2 HR, 2 SB 14 BB. still hitting the ball on the ground (2:1 GO/AO), so maybe that "improve his swing plane" still applies. traded in the Kelvin Herrera deal. A rare Kelvin for Kelvin swap.